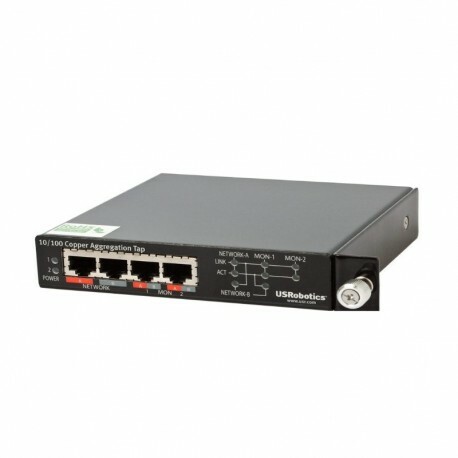 USRobotics new 10/100 Copper Aggregation Tap with traffic injection provides a reliable solution for 24x7 capturing of full-duplex Ethernet links in a combined single stream of data on a network link with the ability to inject traffic back into the network when needed. This tap faultlessly combines and processes both the TX and RX streams of data into a single data stream that allows any connected monitoring device (analyzer, IDS, probe) to receive a full-duplex stream of data with only one NIC. With two monitor ports, the combined stream of data can be sent to two separate network tools ideal for dual tasks like scanning for network discovery or when security devices need to inject traffic back onto the network. In addition redundant power solutions ensure network up-time even when the main power source is unavailable making this aggregating tap the ideal solution for secure, stable network traffic. - Comes with convenient built-in rackmount for use with optional 1U rack mount kit for up to 3 devices.